Award-winning broadcast journalist Charles Gibson will deliver Lawrence University’s principal commencement address to a school-record number of graduates Sunday, June 15 at the college’s 165th commencement ceremony. 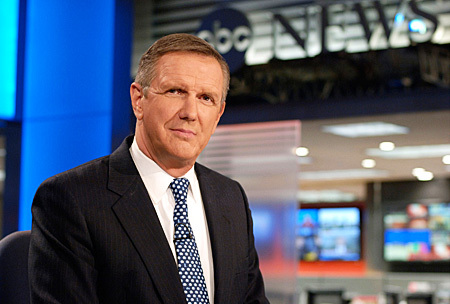 Charles Gibson spent 33 years of his 40-year broadcast career with ABC News. Commencement exercises for the largest graduating class in school history begin at 10:30 a.m. on Main Hall green. Lawrence is expected to award a school record 387 bachelor degrees to 370 students from 35 states and 20 countries. A live webcast of the commencement ceremony will be available at http://www.livestream.com/lawrenceuniversity. President Mark Burstein, who will preside over his first commencement, along with Lawrence Board of Trustees Chair Terry Franke and senior Fanny Lau from Chicago, will join Gibson in addressing the graduates. Prior to commencement, Lawrence will hold a baccalaureate service Saturday, June 14 at 11 a.m. in the Lawrence Memorial Chapel. Stephen Sieck, assistant professor of music and co-director of choral studies, presents “The Wonder of Unfairness: Why You Can Be Happier than My Dogs.” The baccalaureate service and commencement exercise are both free and open to the public. Two retiring faculty members, Richmond Frielund, associate professor of theatre arts, and Richard Yatzeck, professor of Russian, will be recognized for their 34 and 48 years of service, respectively, with honorary master of arts degrees, ad eundem, as part of the graduation ceremonies. Lawrence will award broadcaster Charles Gibson his third honorary degree as part of the college’s 165th commencement. Among Gibson’s many career highlights were interviews with seven sitting presidents, serving as moderator for two presidential debates and investigating the Space Shuttle Columbia tragedy, for which he earned an Emmy Award. Other noteworthy career reporting assignments include the 1995 Oklahoma City bombing of the Murrah Federal Building and the execution of convicted bomber Timothy McVeigh six years later, the 2005 death and funeral of Pope John Paul II from Vatican City, the shooting tragedy on the campus of Virginia Tech and interviews with world leaders ranging from U.N. Secretary General Kofi Annan and British Prime Minister Tony Blair to the late Yasir Arafat and Nelson Mandela, among others. A native of Evanston, Ill., Gibson grew up in Washington, D.C. and earned a bachelor’s degree in 1965 from Princeton University, where he launched his journalism career as the news director for the university’s campus radio station. In addition to his 2004 Emmy Award, Gibson was recognized by the New York State Broadcasters Association with its 2010 Broadcaster of the Year award. He received a National Journalism Fellowship in 1973 from the National Endowment for the Humanities and the 2006 Paul White Award from the Radio and Television News Directors of America. Quinnipiac University honored him with the Fred Friendly First Amendment Award in 2008. A member of the Board of Trustees at Princeton, Gibson has previously delivered commencement speeches at New York’s Vassar (1989) and Union (2007) colleges and New Jersey’s Monmouth University (2006). Lawrence is the third college to award Gibson and honorary degree, joining Union and Monmouth.